Look at us Mediterranean folk — all fit and healthy thanks to our diet heavy on vegetables, fish and olive oil. Or so the story goes. It’s trendy to speak of the “Mediterranean diet,” but there are so many variations in the food people eat around the Mediterranean basin. And not to burst any bubbles, but the obesity epidemic hasn’t exactly skipped over some parts of this region. (Though some people say this is because we’re abandoning traditional Mediterranean diets.) But I digress. I was reflecting on the different cuisines around the Mediterranean basin as I made a Spanish tortilla for the first time in several years. Spanish tortillas are similar to what others might call a potato quiche or frittata. The ingredients are overwhelmingly simple — egg, potato and olive oil — though there are variations that include other vegetables. In general, it’s fair to say that this carbohydrate cake may not be the first thing to come to mind when you think Mediterranean food. And to show just how broad Mediterranean food can be, this certainly is not like anything you’d find in Israel — the closest relative is quiche (generally with actual vegetables) or potato kugel in Ashkenazi homes (which omits the olive oil and uses much less egg). But a Spanish tortilla is an enjoyable dish — because it brings back memories of afternoon tapas in Madrid, because it can sit in the fridge and make for easy (and baby-friendly) meals, because it requires basic ingredients that you’re likely to have around even if the pantry is nearly empty. This is another dish I learned from Sra. Pilar, my landlady in Madrid. As is often the case for traditional foods with few ingredients, getting it right is all about the technique. The potatoes are pan-fried in a generous amount of olive oil — no lid, or the potatoes will steam and the tortilla will taste watery. Then you add the egg and cook it all on the stovetop — hopefully without letting it burn or stick. To cook the other side of the tortilla, you have to flip it using two plates — a trick in and of itself. To make matters more difficult, I’ve stopped using coated cookware such as teflon, so I do all this pan-frying in a cast iron pan. If all goes well, you have a beautiful, golden yellow tortilla that would do a Spanish mother proud. I fed little slices of tortilla to my baby, who gleefully mashed it against his face. Yet I couldn’t help but feel a little closer to those carefree younger times in Spain. Slice the potatoes into thin discs, about 2 millimeters (between 1/8 and 1/4 inch) thick. Roughly chop the discs into pieces no more than 2 centimeters (1 inch) square — the precise shape or size doesn’t matter, but the thickness of the slices determines the texture of the tortilla. 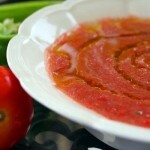 Heat 4 tablespoons (50 grams) of oil in a 25- or 26-centimeter (10-inch) frying pan. I you’re using a teflon or other form of non-stick pan, you may not need the whole amount, so add the oil gradually. I use cast iron and I found this was a good quantity. Toss the potato slices into the pan, and pan fry on a medium flame, stirring often so that the potatoes don’t stick and don’t brown too much. You want them to soften, but not to turn dark. This could take 15-25 minutes. In the meanwhile, crack the eggs into a bowl, add the salt, and beat. Once the potatoes are mostly soft but not fully cooked (they can have a light crunch still — they’ll be cooked more inside the tortilla) scoop them out of the pan and into the eggs, leaving behind whatever oil is still in the pan. Mix the eggs and potatoes until incorporated — it’s OK if the hot potatoes cook the eggs slightly. Make sure the pan is still oiled, add more oil if necessary, and then pour the potato-egg mixture into it. Shake the pan so that the tortilla is relatively even on top. Cover with a lid and let it cook on a low flame for about 5 minutes (the lid isn’t traditional, but I find it helps here). Once the tortilla starts to pull away from the sides of the pan, it’s time to flip it. For this, you need two plates, both at least as large as your pan. The center of the tortilla will still be liquid at this point. Remove the pan from the flame and place plate #1 upside down on top of the pan. Carefully flip the pan and plate together, and then remove the pan — the tortilla should drop out of the pan and onto the plate. A bit of liquid egg will ooze around the sides. Then, put plate #2 upside down on top of the tortilla and plate #1, and flip again. Now the tortilla should be sitting uncooked-side up on plate #2. Make sure your pan has oil in it, adding more if necessary. Put the pan on top of the tortilla, and use plate #2 to flip the tortilla back into the pan. Now you should have your tortilla sitting in the pan, cooked side facing up. Put the pan back on a low flame for another 2-3 minutes. To serve, flip the tortilla out of the pan and onto a clean plate. You can choose whichever side looks nicer as the top. Serve in slices like a pie or cake. 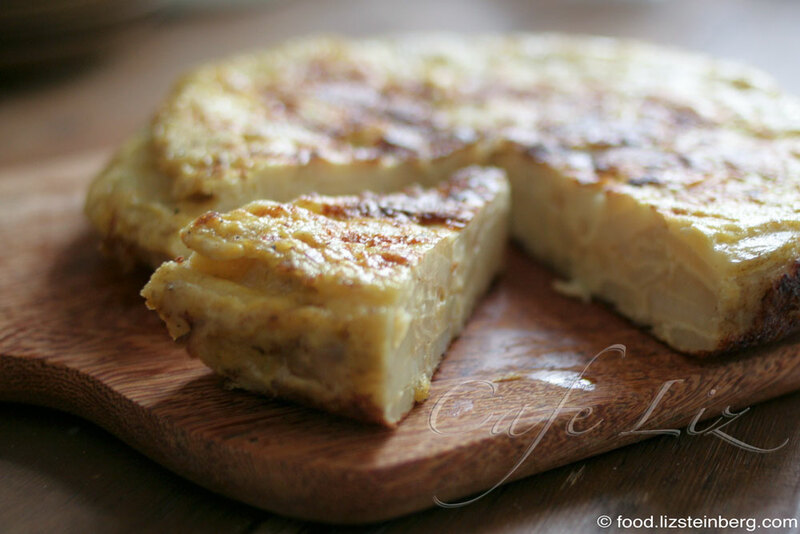 6 Responses to "Spanish tortilla"
really an excellent â€œtortilla EspaÃ±olaâ€ the same my wife thatâ€™s from Sevilla prepares. 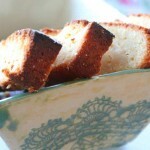 I really enjoy yoor posts and recipes !! We love spanish omelettes in our house. 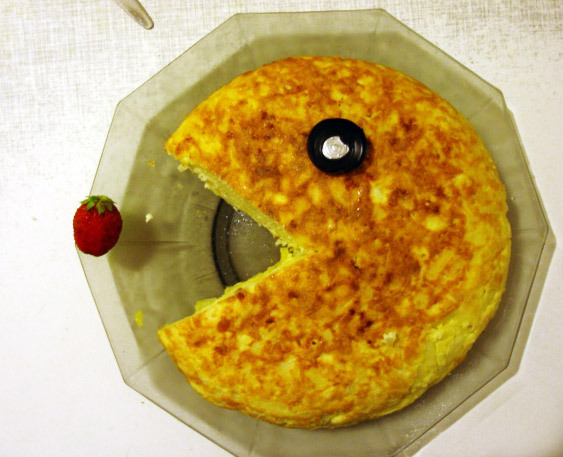 I also have to flip in my cast iron pan, so if I am feeling like I may not succeed, I just finish it off under the broiler, which actually makes it a frittata, I suppose… love the pac man idea. Auralee would crack up if I did that. What do you think about sweet potatoes? They brown more quickly so one must take care, but would it be the same dish? And a spice if there was one, is there some traditional flavor? Love your posts. 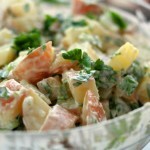 Hi LW, it wouldn’t be the same dish with sweet potatoes, but that’s still an interesting idea! They’d also get softer than regular potatoes, I’d think, so you’d have to be careful about that. If you’re going for something untraditional, you might as well use pie spices like cinnamon and nutmeg, or even a baharat mix.